Karuak Ceremony – The Best 5 Tips You Need To Know! 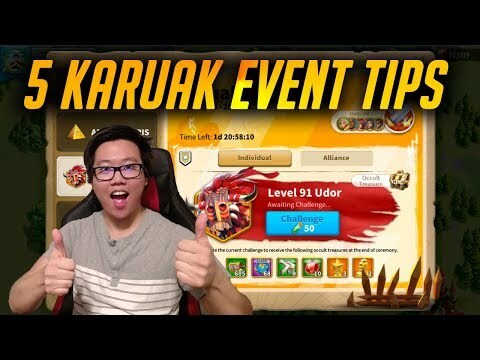 Hey guys, today we aren’t going to be give the 5 best amazing tips for the Karuak Ceremony Event in Rise of Kingdoms! 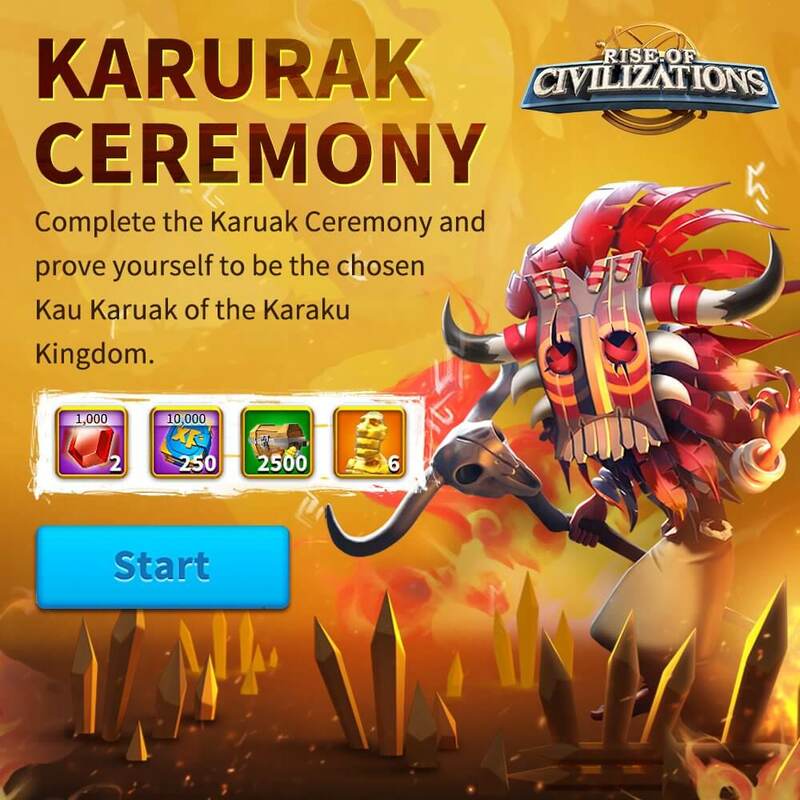 Complete the Karuak Ceremory and prove yourself to be the chosen Kau Karuak of the Karaku Kingdom! Which Runes Should I Be Obtaining During Karuak Ceremony? Which Commander Should I Use? Should I Use Any item Boost? How to Save Action Points? How to Get More Action Point Recoveries? Description: During this event, players need to challenge and defeat different levels of Udor to receive a lot of great rewards. At the beginning of the event, you need to choose the difficultly. The difficulty cannot be changed during the event. Harder modes offer better rewards. You can attack Udors normally by launching a regular attack. Or, you can launch a rally on them. You can also calling for help and an ally will be able to launch a rally attack on that Udor. Use this when your Castle doesn’t have enough troop space. Doing this costs 1x Mark of the Karuak (can be obtained by defeating Udors). The one who helps ally running the rally has the chance of getting 1x Mark of the Karuak. 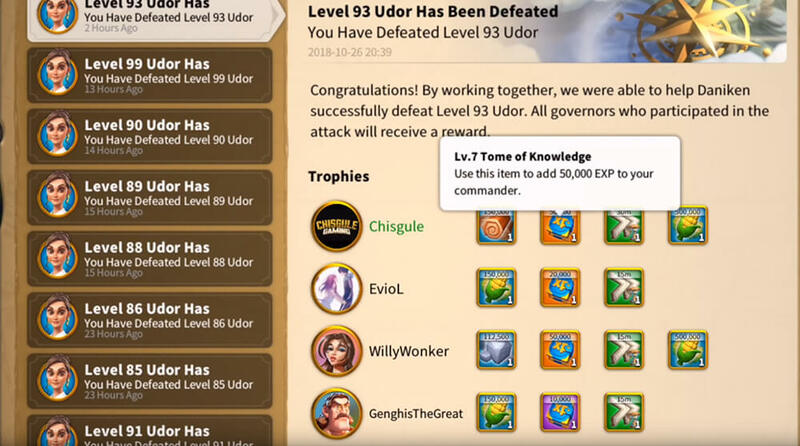 By helping allies defeat Udors, you will also get a lot of rewards. Any additional reinforcement cannot be sent to the rally after it has departed. All players receive 5x Mark of the Karuak at the beginning of Karuak Ceremony. Unused Marks will be reclaimed at the end of the event. 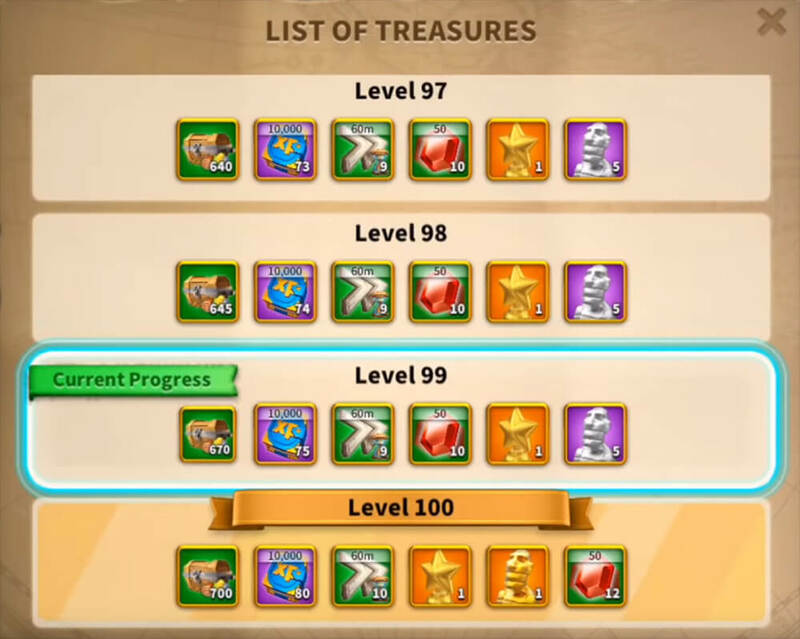 At the end of the event, players will receive a treasure based on the highest level they got. By helping Alliance members attack Udors, you will also get a lot of rewards! Insane rewards you can easily get when you do it right! Any Commander XP Buff Rune! This is because when you summon the neutral units for the event, you are going to gain some experience points by defeating them. 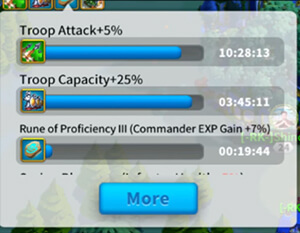 So it is crucial for you to obtain a commander XP Buff Rune to maximize leveling up your desired commanders. Also, at each incremental level of 10 (Elite levels), the XP reward is significantly increased. Not just because he has the Lohar’s Trial skill that increases the amount of XP you could get as you still can get benefit from it when he is the secondary commander. The real reason here is because of his talents! 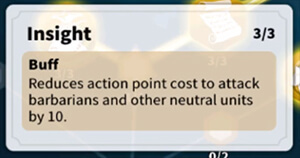 First we have Insight, the talent that reduces the action point cost when you attack any neutral units. 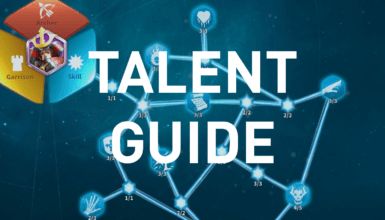 When you send Lohar with this talent Insight available, it is going to reduce a lot of the action points when you do a consecutive attack. 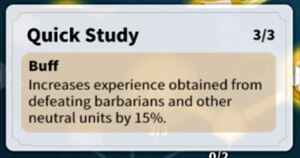 Also you also get 15% more XP points by having the Quick Study talent. If we add this up to the the Lohar’s Trial skill, it is going to increase the XP gained massively. 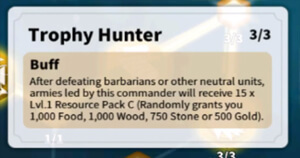 Lohar also has the Trophy Hunter talent, which gives you 15x lvl.1 Resource Pack C after every time you defeat a Barbarians or a Neutral Unit. In addition, Lohar has the Rejuvenate and it’s going to be able to cast the healing skill a lot quicker. And then we have the Elixir as well, which is is crucial so that your healing effect gets increased a lot. Your troop is going to be able to last a lot longer in the battlefield and that’s going to affect your consumption of action points as well. 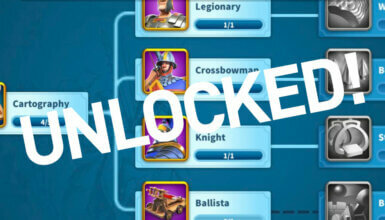 You should use the Troop Attack Boost and the Troop Capacity Boost. This is because as you get farther in Karuak Ceremony, the enemy gets a lot more difficult. So having these offensive buffs is going to really help you out. You can either use the 50% Capacity Boost one, which is the advanced. Using the Basic Boost (25%) is totally fine at the first 70-80 levels. Using these boosts is going to help you out with the action points as well. The reason is that the more the troops you have the longer and the stronger your army is, the longer you can last in the battlefield, the less action points you need to spend. It is to use consecutive attacks! You want to prevent your units from going back to the base. You need to camp them before attacking another neutral unit or Barbarians. This reduces the action points needed. Every time you do a consecutive attack, it’s going to reduce two action points. This effect can stack a maximum of 5 times. When you do this 5 times, the 5th attack only costs 40 Action Points instead of 50 . From the 5th attack, every attack will cost only 40 until the dispatch returns home. Do the Daily Objectives! You can get 1x Basic Action Point Recovery every day, which will give you 100 . Buy the Basic Action Point Recovery in the VIP Shop with Food. Buy the $2.99 Treasure of King Offer (If you want to spend a little bit of money). This is the best daily offer you could buy for getting Action Points. And that is it guys! 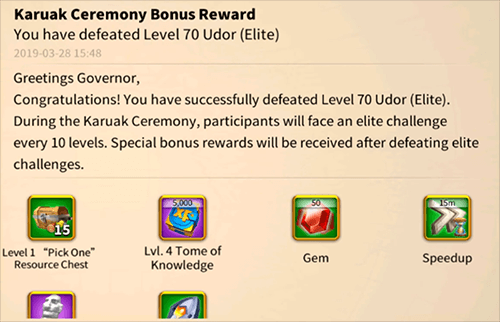 Hopefully you have found the best tips for finishing the Karuak Ceremony in Rise of Kingdoms with ease!